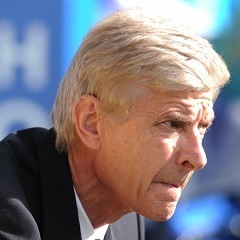 Cape Town - Arsenal manager Arsene Wenger has responded to criticism from shareholder Alisher Usmanov by claiming the Russian was wrong to go to the press. Wenger watched his side suffer yet another defeat to Manchester United at the weekend, despite completely dominating the clash at the Emirates Stadium, prompting further criticism from pundits and fans alike. That result means the Gunners have now made their worst start to a League campaign in 32 years and many believe that Wenger's time at the north London club could soon come to an inglorious conclusion. Usmanov, who is the club's second-highest shareholder behind American Stan Kroenke, was scathing in his assessment of the French tactician and believes Wenger 'is not learning from his mistakes'. With the pressure mounting on Wenger to steady the Gunners ship, the former Monaco boss insists he is able to take the criticism in his stride, but was not pleased that Usmanov made his views public. "I've shown I can take criticism in the 18 years I have been here," Football411 quotes Wenger as saying. "Everyone has the right to an opinion. We must show solidarity. When we have something to say to each other, we should do it face to face. We don't need to go to the newspapers."